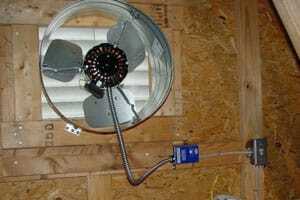 There is a world of difference between Air Conditioning and Attic Fans, also known as Whole House Fans. While Air Conditioning is essential for cooling your house, an Attic Fan helps with good air flow, reducing energy costs, minimising temperatures in your house and ensuring that your entire home is more energy-efficient. Everyone feels more comfortable and you can save money. Attic temperatures can reach up to 150 degrees in Los Angeles and the surrounding areas: this means that your AirCon works twice as hard, costing you more money to cool your house. It also means that any items in your attic can get damaged, which may include family heirlooms and prized possessions. And no, we are not talking a lot of hot air! The hot air itself can be damaging but A.D.I. Electrical Services can install a Whole House Fan which will cool the airflow through your house and your attic. Also, if you situate a fan vent near your kitchen, it can completely clear the smell of cooking in a couple of minutes. A properly functioning attic fan will help you keep the air temperature more stable, reduce your energy costs by up to 30% and help you enjoy your home even more. It will also help prolong the lifespan of your roofing materials, cool your living spaces upstairs, not to mention the substantial financial savings for your heating and cooling bills.